Arms Dealers on Trial by Mel Strickland. 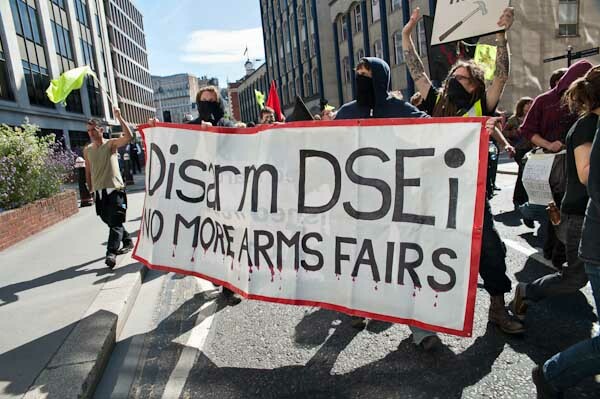 In September 2013 a group of activists took part in demonstrations against the DSEI arms fair which comes to East London every 2 years. They put their bodies in the way of military traffic and disrupted the set up of the arms fair. One group, charged with obstruction of the highway, mounted a high profile campaign against the arms fair and the business of war, and when the charges against them were dropped a week before their trial, they turned the tables on the arms dealers and the UK government that supports them, by bringing a private criminal prosecution against 2 companies – Magforce International and Tianjin Myway – known to have broken UK laws on arms control. 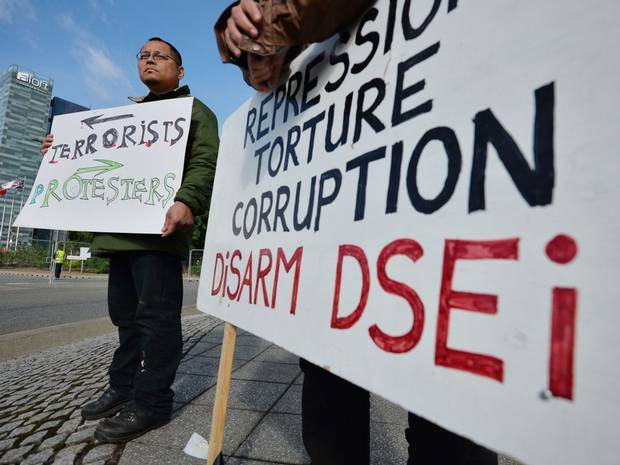 The companies promoted torture weapons at DSEI (including leg shackles, shock batons and shock guns). Although this was revealed in Parliament by Caroline Lucas MP, the authorities and the government refused to prosecute the companies or reveal the extent of their investigations into breaches of the law. 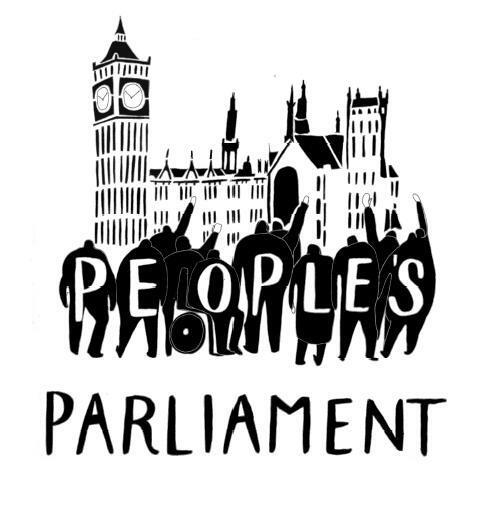 The private prosecution was ultimately shut down, it was too embarrassing for the government and the CPS called a private meeting with the lawyers of the activist group to explain why the case had to be dropped, avoiding any paper trail. Vince Cable disingenuously told a Parliamentary committee that he would investigate why the companies were not prosecuted, despite the fact that the activists’ lawyer wrote directly about it to him, and other authorities, and the crimes were exposed in Parliament at the time! Come and hear the Arms Dealers on Trial story, and learn how we can fight the arms fair in our city this 2015! 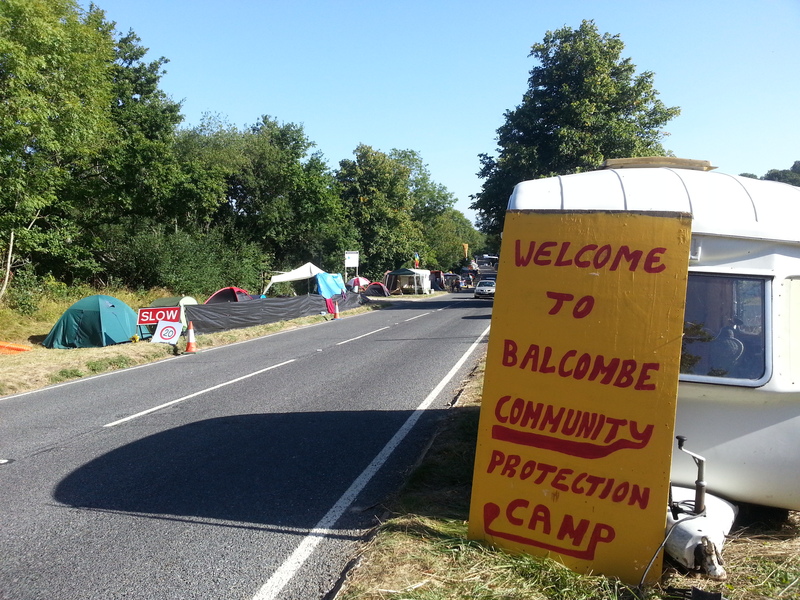 The activists are against the business of war and all arms fairs, they do not support a ‘better regulated’ arms fair. STOP THE ARMS FAIR VISITS BAE SYSTEMS. Tweet chat with David Finkelstein of the Times by Aengus Mac Og → ← Autonomous Nation of Anarchist Libertarians A.N.A.L.